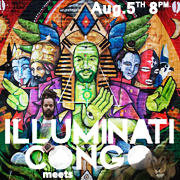 Fresh from Chicago, via Sydney, comes Illuminati Congo a conscious rasta hip hop artist. In his words: Having studied and taught Kundalini Yoga and Rebirthing Breathwork as well as being an avid herbalist in the Rastafarian community, Jahns true goal is to heal. Heal the world of its ills through awareness of self and the practice of unconditional love. Hip hop is an art form that has the ability to communicate complex ideas to a potentially large audience, let it not go to waste! This is gonna be an Epic Night – Illuminati Congo live and direct MCing on the Mighty Black Giant Sound System. A chat between friends about Friday the 5th of August – has allowed two collusus (giants!) to combine. 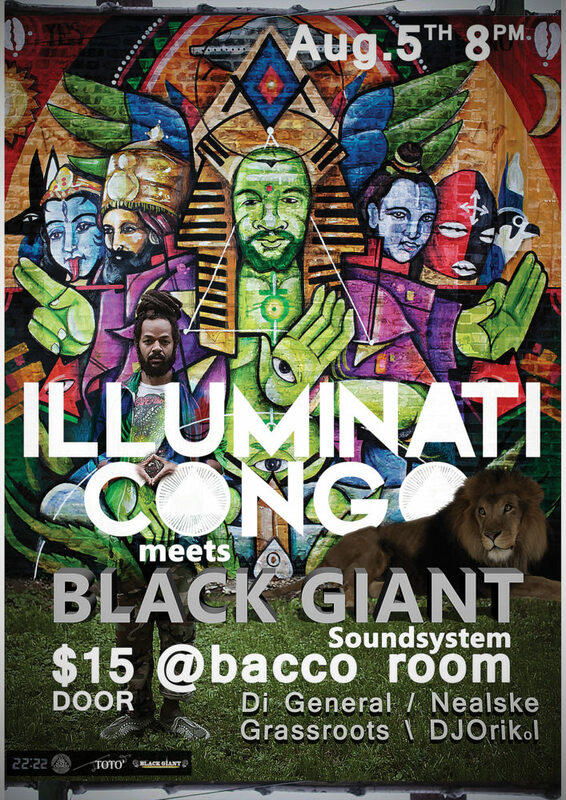 Black Giant Sound System will now be combining forces with Illuminati Congo for a very special event. Illluminati Congo hails from Chicago Illanois and brings a concious fusion of Reggae and Hip Hop elements. Guided by higher conciousness and drawing inspiration from African and Eastern mysticism, Illuminati Congo will be taking us on an epic musical journey – Hold Tight and Get ready Y’all! Selectors Di Genera,l Nealske and Grassroots will be fielding heavyweight Roots and Dancehall vinyl through the newly refurbed Black Giant bass speaker stacks. Booyaka Shot! Extra Special Guest Selector DJ Orikol has been mashing up Auckland Dancefloors over the past year playing the latest Dancefloor heat outta Africa. Dancefloor Nah Cease! Jahn The Baptist is unlike any other rapper out there. He is able to utilize his mantra of “as above, so below” to formulate a refreshing unity of the higher self and lower self. His lyrics reflect both his practice of spirituality and his embrace of earthly, human desires. His words are meant to appeal both to Yogis as well as the inner city Hood- with an authoritative demeanor that lets you know he is equally of both. Having studied and taught Kundalini Yoga and Rebirthing Breathwork as well as being an avid herbalist in the Rastafarian community, Jahns true goal is to heal. Heal the world of its ills through awareness of self and the practice of unconditional love. Hip hop is an art form that has the ability to communicate complex ideas to a potentially large audience, let it not go to waste! Post by tomachi, posted on July 31, 2016 at 3:09 am, filed under Gigs. Bookmark the permalink. Follow any comments here with the RSS feed for this post. Both comments and trackbacks are currently closed.